The magic is in the TouchPico’s infrared pen, which, when pressed onto a surface, outputs an infrared signal that is read by a camera on the front of the projector. This means that users can manipulate the projected screen using the pen like they would a touchscreen device with a finger. 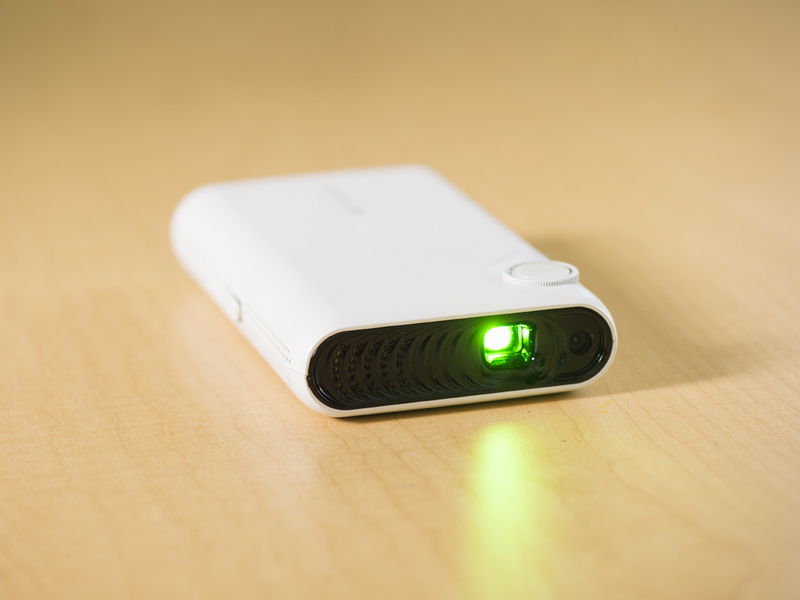 The device itself is a pico projector that outputs a 854 x 480 display onto a screen or a wall. Paired with the projector is an Android 4.0 device running on a Rocketchip 1GHz processor with two cores. There’s also an HDMI port so the TouchPico can be used like a more traditional projector. I saw a short demo with a pre-production TouchPico at Gigaom’s New York office last week and was pleasantly surprised. The latency on the infrared pen is negligible, and the Android device showed little lag. I played Fruit Ninja, which offers a good example of how even a few milliseconds of lag can seriously hamper a product like this. Yes, I was able to pull off a few combos. I also saw the TouchPico’s capabilities as a projected whiteboard using Android drawing apps. Some Android-equipped pico projectors, like Sprint’s(s s) LivePro, have paired the pico projector with an on-device touchscreen. Other approaches have used cameras like Microsoft’s Kinect to add touch-like features through motion tracking. Although TouchPico’s infrared approach is simpler and doesn’t support multi-touch gestures, it also means it is lower-cost and easier to implement in a production product, and according to the company, doesn’t put any extra strain on the CPU. TouchPico CMO Slava Solonitsyn says the target market is education. Interactive whiteboards — made by companies like SmartBoard — are often installed in schools, despite costing thousands of dollars. That high pricetag rules them out for developing markets and price-sensitive school districts, but the TouchPico promises very similar abilities for a fraction of the cost. Eventually, according to Solonitsyn, the infrared camera and pen technology will be available to other projector makers. The TouchPico was first announced at CES earlier this year, and will be widely available around the holiday season even if the Indiegogo isn’t fully funded. Currently, $270 gets you one of the first TouchPicos off the line, but the price will rise to $500 when it’s released commercially. $500 is a little steep in my opinion. It looks to me that all they did was integrate an infrared camera, marketed an infrared stylus, and wrote a couple of programs into a tiny, weak picoprojector. AAXA has a projector for the same price that’s 5x brighter and also runs Android.